Free book. No opt-in required. 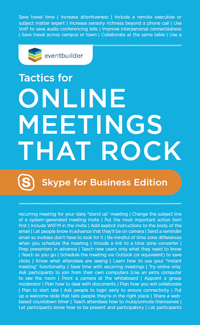 Useful for any online meeting platform. Skills-oriented. Not a software manual; focuses first on tactics. Organized for reference. Designed for usability (you're not taking a college course here). Straightforward action items. No drawn-out stories about "That one time when..."
Foreword by a 'softie. A BPM (Business Program Manager kindly share goods things with you and says nice things about us. Original Pacific Northwest artwork by the EventBuilder team. Who needs another stock photo? We didn't think so. Note: you may need to right-click to download.